It's not just psychological: When your favorite team wins a game, you may actually profit. SPORTS, WE KNOW, are big business. The Red Sox are worth more than $800 million, the Patriots at least a billion. China spent more than $40 billion to host the just-completed Olympics, an event dedicated, at least in theory, to showcasing the spirit of amateur athletic achievement. Even for the individual fan, the price can be high, whether it's measured in money, time, or lost sleep. A good seat at Gillette Stadium can run you $169; an NBA season is hundreds of hours of basketball. And then there are the hours spent Monday-morning quarterbacking, the sums lost in office betting pools, the money spent on replica jerseys and commemorative beach towels, the time spent crafting taunting e-mails and the time spent responding to them. With costs like these, it's inevitable that people will, from time to time, ask what sort of return they get on their investment. Sure, there are the occasional moments of euphoria, the feeling of boozy comradeship we feel toward strangers at sports bars, but is there, perhaps, anything more concrete? In Boston and other American cities, the question tends to come up whenever one of the city's pro teams asks the legislature for money for a new stadium. Or it emerges when a New York or London or Paris is vying to host a mega-event like the Olympics. The usual answer from local boosters is that a pro team or an Olympics - by employing local workers, by drawing big-spending fans, by giving a city media exposure - helps out the local economy. 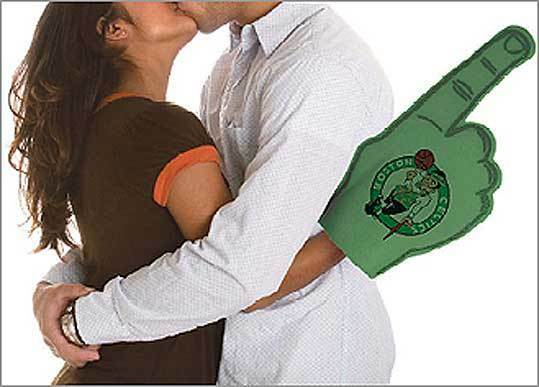 Even if you don't care about the Celtics, or the triple jump, you're still profiting by their presence. Economists are generally skeptical of these claims. But a few scholars have started to suggest that there may indeed be another kind of benefit from big-time sports. There's a catch, though: the team has to be good. In a forthcoming paper, economist Michael Davis and the psychologist Christian End say that having a winning NFL football team increases the incomes of the people who live and work in its hometown by as much as $120 a year. And while the study doesn't identify exactly what causes the boost, the authors point to psychological literature suggesting that winning fans are at once harder workers and bigger spenders. In short, buoyed by the team's success, we work longer hours, take bigger risks, and shop more avidly, all of which helps the local economy. "This collective mass of people in a good mood, that is something that could really bolster the economy," says End, an assistant professor of psychology at Xavier University. Here in Boston, of course, there has been a lot of winning recently. Between the Patriots, the Red Sox, and the Celtics, the city is enjoying an era of almost unprecedented sports dominance. The only one of the three that is not currently the reigning champion, the Patriots, starts its season today with the goal of redeeming a season that came within a couple minutes of being the greatest in pro football history. If ever there was a city that knows what it means to go from futility to victory, it is ours. The new work suggests that this kind of success on the field can shape a positive mind-set that affects the rest of our lives. Studies have shown, for example, that fans are not only happier when their team wins, they feel smarter, more athletic, luckier, and even more attractive. Other research shows that happy, self-confident people tend to be more successful - at work, in school, in any realm they're competing in - suggesting how the successes and failures of our sports heroes become our own. Here in Boston, fandom has for years been imbued with a certain nobility. Boston fans and their bards like to expound on the great and soul-crippling hardships they have suffered at the hands of their teams. For their first 40 years, the Patriots were usually a laughingstock. The Red Sox, of course, were a paragon of sports futility for the better part of a century. Even the Celtics have been mostly mediocre for the past two decades. New England is a part of the world known for cold weather and Puritan ancestry, so it would be simplistic to blame sports teams for our distinctive regional dourness. But surely all the losing didn't help. Sports psychologists have found that losing does indeed make fans unhappy, just as winning brings joy. While little work has been done to assess the durability of these emotions, they can be quite powerful - one survey, for example, found that West Germans professed themselves more pleased with the national economy and their own jobs after their national soccer team won a game at the 1982 World Cup. But what is particularly striking is the almost comical extent to which fans appropriate the successes and failures of their team. Like a stadium full of stage moms, they see the accomplishments of their team as reflections of themselves. Edward Hirt, a professor of psychology at Indiana University, has found that the school's famously ardent basketball fans saw their opinion of themselves rise and fall with the fortunes of the team. Over the years, he has conducted various versions of a study in which fans, after watching a game, are asked how well they thought they would do at a variety of tasks - throwing darts, shooting free throws, solving various word games, even rolling dice. Consistently, both male and female fans showed a sharp rise in confidence in their abilities on all the tasks after a win, and a corresponding drop after a loss. Winning even made fans feel sexier: When shown a picture of an attractive member of the opposite gender after a win, they were far more likely to say they would be able to get that person to go on a date with them. Findings like these suggest that there might be a broadly shared psychological boost from our stubborn inability to separate our own accomplishments from those of a group of multimillionaire professional athletes who have never heard of us. Multiple studies, for example, have shown that testosterone levels in male fans rise in the wake of a victory, and drop in the wake of a defeat. A study published earlier this year of traders on the London Stock Exchange found that the ones with higher levels of testosterone made more money than their colleagues - the researchers suggested that it might be because the hormone emboldened the traders to take bigger risks. A large body of psychological research suggests that the kind of psychological changes seen in fans after a victory could translate into positive behavior. More self-confident people tend generally to do better at life: they get better grades, make more money, have more friends, even live longer. And the self-confidence doesn't have to be earned to make a difference. Shelley Taylor, a UCLA psychologist, has found that having outright illusions about one's abilities, and about the amount of control one has over the events in one's life, makes people happier, harder working, and more successful at whatever they put their minds to. When Taylor looked at AIDS patients in the late 1980s (a time when the disease was far less treatable than it is today), she found that those with an unrealistically optimistic sense of their prognosis lived an average of 9 months longer than those with a more accurate understanding of the disease. The illusion of control, of course, is a pretty fair description of sports fandom. It explains better than anything else why people spend so much of their lives sitting in a special spot on the couch, wearing their lucky jersey, and upbraiding the television. Drawing on work like this, the Davis and End paper set out to see what large-scale economic impact a winning team might generate for its fans. In doing so, they were expanding on a 2002 paper by the economists Dennis Coates and Brad Humphreys. Coates and Humphreys had found that when an NFL team won the Super Bowl, its home city saw a boost of about $140 in per capita income. Perhaps, they suggested, winning might be making people more productive. Davis and End decided to define winning more broadly. Looking at data from 1969 to 1998, they charted win-loss record against per capita income. Even after controlling for factors like the size of the city, how much money it spent on its team, and a host of local factors that might affect some sports markets and not others (natural disasters, oil booms and busts in Texas and Louisiana, the tech boom and bust in Northern California), they found that, for every win in a city's NFL team's record, per capita income in the city rose around $10 - not enough to change anyone's tax bracket, but, multiplied over the course of all of a city's inhabitants, enough to add up. To the authors, the finding was evidence that all the psychic benefits of winning translate into a very modest but measurable economic boost. Fired up by their team, people are working just a little harder and longer; inflated with borrowed confidence, they are charming bosses and earning raises. And even if the effect lasts only a few days, or a week, more wins means more productive weeks. "To be successful, you have to take some risks, you have to sell yourself," says Hirt. Still, some sports economists are critical of the story Davis and End tell. For one thing, they point out, the researchers detected the effect only for football - not baseball or basketball, the other two sports they looked at. "Does that mean we're not as happy about Ortiz and the Red Sox winning the World Series as we are about the Patriots?" says Victor Matheson, an economics professor at Holy Cross. "That doesn't sound right to me." Matheson has done work of his own looking at the economic impact of Super Bowl wins and found a far smaller effect than Coates and Humphreys. Davis and End have a couple responses on the baseball and basketball question. For one thing, they say, the football season has fewer games, so each win and loss would be expected to have more of an impact on fans' mood. But another explanation might be timing. Along with productivity, another way for winning to go to the heads of fans is by inciting them to go shopping: economists have found that people tend to spend more (and donate more to charity) when they're happy. And since the holiday shopping season falls in the middle of the NFL season, Davis and End suggest that football wins could have an exaggerated effect. Davis and End admit that their finding is in certain ways only a first step, inviting more study. What's already clear, though, is that being a fan can have a major psychological effect on a person. And whether or not it makes us richer, it does seem to make us healthier. Psychologists have long known that, win or lose, rooting for a team has its benefits. Work by Daniel Wann, a psychologist at Murray State, has found that fans of a local team tend to be happier than nonfans (and happier, too, than fans of non-local teams) - less prone to depression, anger, and stress. The reason, he argues, is simple: being a fan automatically places a person in a community, giving him people to talk to, something to talk to them about, and events at which to do it. The bond can be a first step toward a deeper friendship, or it can simply lend a comforting sense of belonging when, say, a Bruins fan walks down the street and sees someone wearing a Bruins cap. Maybe that's something to remember today, in the moments just after the final whistle. If the Patriots win, it might mean a few extra dollars for you. And if they lose, you can content yourself with the knowledge that the four hours you just spent in front of the television, eating tortilla chips, drinking beer, cursing the officiating, and taking in the truck ads you'll be watching for the rest of the season - those were good for you.